On 16th of January we start with the first Winter Axe Throwing League in Slovenian history. What can be better than hot and fun sport with a lot of adrenaline which will warm you on cold winter nights! Gather a group of friends and come to the Axe Throwing Europe™ Center at Kajuhova 35 in Ljubljana, the space of openness, passion and fun. And what’s the best? You don’t need any pre-knowledge. And no one will force you to wear funny lumberjack shirts. Unless you want it yourself. Throwing axes is suitable for everyone. Even more! Are you looking for an idea for a good date? Are you home-based thrower who would finaly like to shine? Do you like to hang out with the best teammates? You can bring your girlfriends, boyfirends, parents and dogs to open events. Lone wolves are also welcome. The majority of competitors at the Winter League are beginners who are instructed. Our instructors quickly educate them on safety and teach them about the art of throwing axes. You will be amazed how quickly your axe will stick into the target. 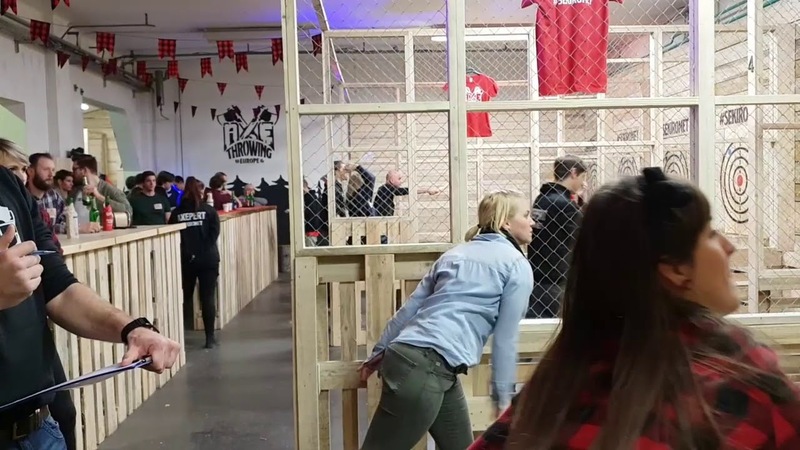 The Winter Axe Throwing League is not just for competition or improving the technique. You will join the community of special and interesting people who like throwing sharp objects and having fun doing it. We assure that while throwing axes and competing with others you will feel the adrenaline rush which will enchant you and the enthusiasm will increase from week to week until the last day of the competition. The winter leagu will take place between January and May 2019at the Axe Throwing Europe™ center at Kajuhova 35 in Ljubljana and it will be considered for the National Championship in throwing axes by the WATL system. Winter League has seven competition days (16.1., 30.1, 13.2 ,. 6.3, 20.3, 3.4, 17.4) and final eighth day (15.5. ), Which is competing against the best athletes in the system loss where the best competitor in all days compete against each other. The winner of the final tournament will be crowned as the winner of the Winter League and at the same time also the first national champion of the Republic of Slovenia. Competition will be held according to the WATL system and rules of Axe Throwing Europe center. You will take a 15-minute free course of throwing axes before the tournament. In tournaments will be used only axes provided by the organizer. You are not responsible for broken axes. The organizer may exclude persons whe are drunk, do not respect the rules or do not come at the time. By signing a statement, competitor agrees with the general conditions of the center and with the rules of tournament. Since the event is public, he/she agrees with publicaiton of photos or videos from the tournament. Maximum 120 competitor per competition day. You apply for each day individually through the online application. You have 4 duels with 10 throws per each competition day. The maximum number of points per match/day/leagu in 64/256/1792. The best 32 competitors of Winter League will qualify for final National Championship. In the case of a large number of contestans, 64 competitors will qualify for the final championship. Any competitor who would like to qualify fort he final tournament can miss a maximum of 2 competitive days but he must make up for his abscence by the 7 day. At the final day it is no longer possible to make up fort he abscence. By playoff system on elimination on 2 winning mathces of 10 throws. The best ones receive awards, we are also setting up a prize pool. If you would like to become a sponsor of the Winter League and the National Championship, please contact us at info@axe-throwing.si. The winner of the Winter League that is National Championship can compete for participation in one of the final tournaments in the US and Canada. More on this shortly. Become Slovenian champion in axethrowing! Become the national champion in the axiom. Register for the next tournament! The number of competitors is limited, hurry!